After it leaves the hillfort of Maes Knoll, which is located just south of the southernmost outskirts of Bristol, Wansdyke runs across the fields towards Publow Brook close to Blackrock Farm. Most of that section is obliterated by the former North Dorset railway, but due east of the A 37, it can be seen again, running toward the stream. By car from Bristol. Follow the A 37 to Shepton Mallet, past the crossroads of Hursley Hill. After a short hollow, the road crosses the old railway line and Wansdyke at the same time. West of the road (to your right) is the old railway, a few metres back and East (the left) is Wansdyke. By car from Bath. Follow the A 4(T) to Bristol, and look for the first sign to the A 37. Then continue as described above. By car from Weston-super-Mare/M5 or Wells. From Weston-super-Mare and the M5, follow the A 371 to Bristol and the A 368, all the way to the A 37: go left and continue to Bristol, where youll pass Wansdyke just across the old railway, a kilometer beyond the B3130. From Wells, follow the A 39 and then the A 37 to Bristol, and continue as described above. By car from Shepton Mallet or Frome. From Shepton Mallet, follow the A37 to Bristol. Pass through Pensford and continue to Bristol, where youll pass Wansdyke just across the old railway, a kilometer beyond the B3130. From Frome, follow the A 362 to Radstock and beyond to Farrington Gurney, where you join the A 37 and continue as described above. Wansdyke is almost non-existant here. Apart from a possible bank, the earthwork either never existed is was ploughed out long ago. After a few metres east of Publow Brook, Wansdyke only re-appears on fairy Hill, west of Compton Dando. This is a very good spot to visit. By car from Bristol. Follow the A 37 to Shepton Mallet, past Whitchurch and the Maes Knoll public house, where you go left to Compton Dando. The road goes across Publow Hill and Wooscombe Bottom. Just before Compton Dando, the road descends rapidly through Peppershells wood. To the left, emerging from the wood, lie remains of Wansdyke. The best view may be from the crossing east of the village (Compton Green). By car from the directions of Bath. Follow the A 4(T) to Bristol, and take the A 39 through Corston. Reaching Wansdyke House below Stantonbury Hill, take the minor road to Compton Dando. 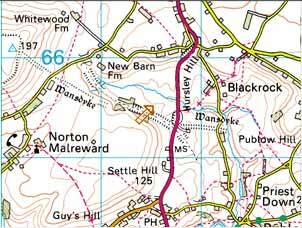 From Weston-super-Mare and the M5, follow the A 371 to Bristol and the A 368, all the way to Marksbury, upon reaching Wansdyke House, take the first minor road left to Compton Dando. From Wells, follow the A 39 and at Marksbury join the A 368, and continue as described above. From Shepton Mallet, follow the A37 to Bristol. 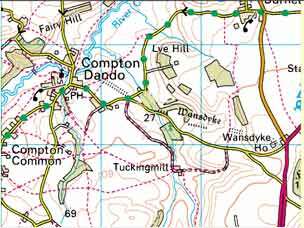 Take the A 368 right to Bath, and after Marksbury, upon reaching Wansdyke House, take the first minor road left to Compton Dando. Alternatively, pass through Pensford and take the minor road to the right, to Publow. 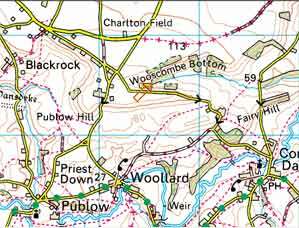 This road, slower but more scenic (it IS marked thus on the map), follows the Chew valley through Woollard to Compton Dando. Publow Hill is to the north. After crossing the River Chew at Compton Dando, Wansdyke is very visible for the first time after leaving Maes Knoll. It now crosses the field east of the village towards Bathford Brook, where it passes several burial mounds in a field to the south. Across the stream, it disappears mostly, re-appearing again before Wansdyke House, where it turns south to climb Stantonbury Hill. click here to return to West Wansdyke, section 2.